Amazing! With only nine days left in the month, what did I spot yesterday in the street but this joyous scene?!? Santas gather to make their way in a parade through Copenhagen on Tuesday during their annual three-day congress. 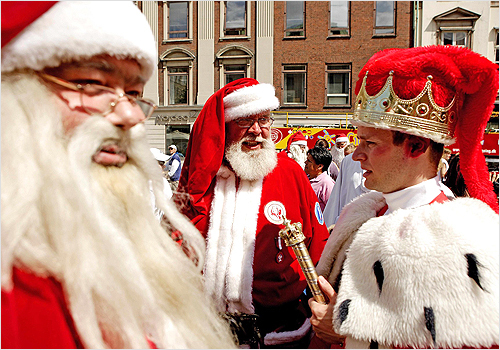 Now in its 51st year, the World Santa Claus Congress brings together 136 red-clad delegates, mostly from Scandinavia but also as far away as Russia, Japan and the United States. Now, there’s a new one for me – a Santa Conference. How come I don’t get to go to fun conferences like that? 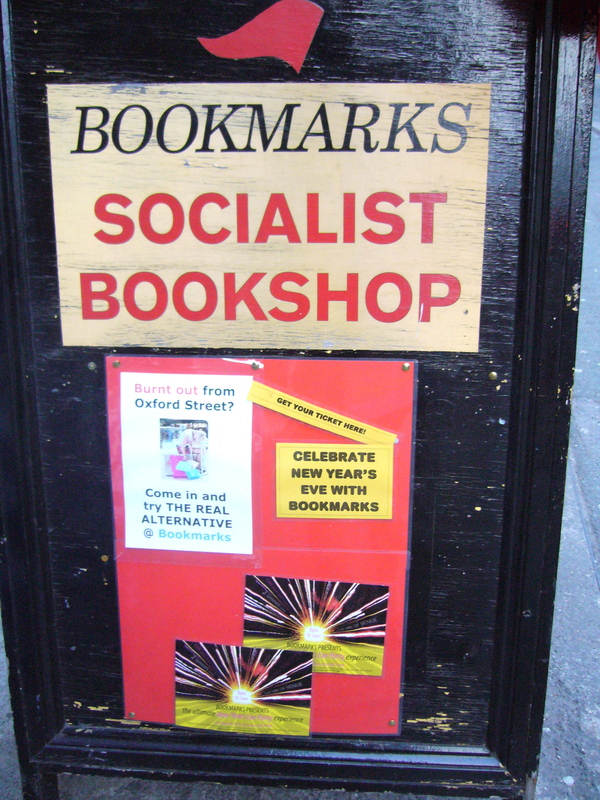 The last one I got to attend was called, I believe: Feudalism in the Modern Age – How to Deal with Ontario’s Many, Many Landlords – or something along those lines. Not a red suit to be seen or “ho ho ho” to be heard. Sigh. Oh – a little Christmas in July tip, while I think of it? Do yourself a favour and read The Santaland Diaries by David Sedaris. It’s his account of working as an elf in Macy’s department store in their Santaland one year. Hilarious. If you’re a podcast type, you can also listen to him read it here. 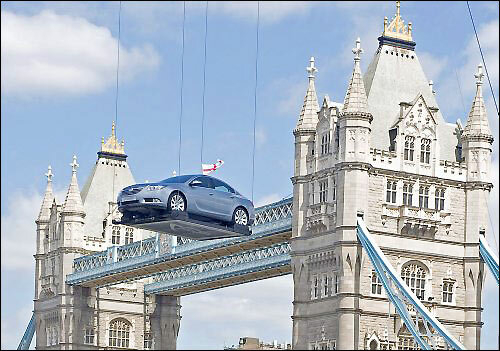 Another example of the Christmas in July spirit in Europe – they’re giving away Vauxhall cars at the Tower Bridge in London!!! Um… not really. Actually, this appears to be a publicity stunt for yet another new model of car. 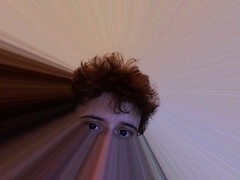 But my explanation of the photo is far nicer, no? 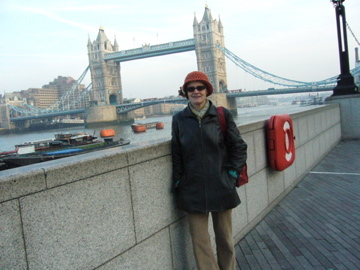 Personally, though, I think that this is a far nicer shot of the Tower Bridge, with a very rare sighting of one of Canada’s most esteemed intellectuals and artisans. But not everywhere in the world is lucky enough to have me and my benevolent presence strolling around, sadly. One place that could really use some benevolence right around now, not to mention a few Santas – Zimbabwe. Apparently they just issued new money over there because their currency is completely in the toilet. This means that one egg costs $35billion Zimbabwean. 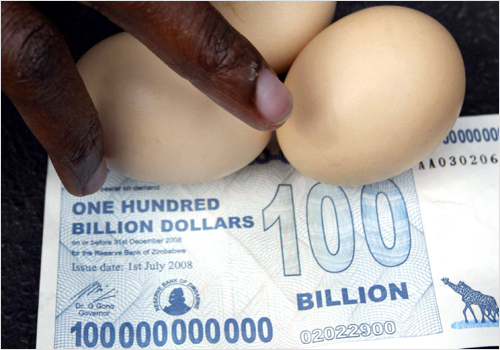 This $100billion note is not enough to pay for the three eggs depicted in the photograph. My math is horrendous – but this must mean the new Vauxhall car would cost… er… something like $200billiontrilliongazillionandquadrillion in Zimbabwe. Sigh. 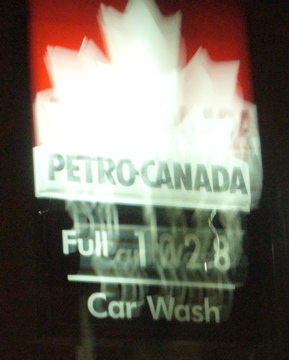 The blur is due to me shaking with rage because the price of gas refused to go under $1 (CDN) per litre. And today? That same litre costs between 126.9 cents and 134.7 cents per litre, depending upon what part of the city you’re in (I like the way they still use “cents” to make you think it’s not all that expensive. Well, that little trick, I’m here to tell you Big Bad Gas Companies, doesnae work.) Apparently in some parts of the country it is nearing $1.50 and a couple of weeks here in good old TO it was $1.38. In other words, not billions – but I find it very difficult to understand how the prices have gone up more than a third in the past seven months, really. Will I find some answers there? Will I, hell. But I’ll be able to work up some guid big old rants, I should think. Happy Wednesday and may Santa be kind to you all. food – a suicide mission? I am going to go cook about $70bil worth of eggs and have some breakfast. Aw hell, I may even splurge and have some toast. Coincidentally I am reading Sedaris’s “When You Are Engulfed in Flames” . The cover features a skull smoking a cigarette. I heard about him when he was being interviewed on CBC. He is funny. One of his essays is about “Stadium Pal”, a device for men who don’t want to bother walking to a washroom while an exciting game is happening and the beer is flowing. It comes with a “freedom leg bag”, though I am pretty sure that isn’t the same freedom as in “freedom fries”. We will also be having a small islands worth of eggs, and we love us some Sedaris. I have also been known to Sedarisize my family’s history! Whaaahahahahaa!! PS that front Santa’s lips like like creepy sausages.